support your oral health with a quality diet! Most people enjoy healthy eating because they want to feel better, live better and maybe even look better. 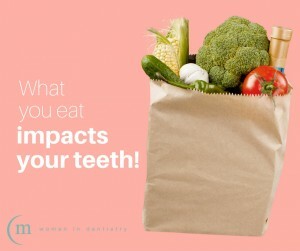 But what you may not consider about your diet is the role it plays in your oral health. At Women in Dentistry, we’d like to share some healthy foods that are good for your body and your teeth. Tea—rich in antioxidants and low in sugar, tea isn’t just good for your body, but may also slow the growth of bacteria in the mouth. Cheese—because chewing more heightens saliva production, you’re also washing away excess debris left behind from other foods. Cheese may also help balance high acidity levels in the mouth. Veggies—carrots, apples and cucumbers require a lot of chewing to break them down, which may also disturb and loosen built up plaque. Coffee—this morning pick-me-up may help heighten your energy, but it is known to stain and darken your smile. Sticky foods like candy and dried fruit can get caught in the crevices of your teeth, making them hard to clean and remove. Chips are high in starch, which can becomes easily trapped in your teeth. Soda—it’s no secret that this sugary drink is bad for your teeth—too much can lead to decay and cavities. Instead of reaching for a soda or juice, consider water. Brushing and flossing your teeth after you eat can help reduce the amount of plaque buildup that can cause excess bacteria leading to oral health issues. Is it time for your next routine clean at Women in Dentistry? Contact our practice today to schedule an appointment for you and your family. If you have questions, our dentist Melbourne CBD and dental hygienist would be happy to discuss your concerns!